Have you seen Ange Mlinko's pissed off look at Seidel? Link on my blog--it's in The Nation. Yeah I read that. I didn't agree with it. And it seemed a little too tinged with a really deep personal dislike that could have infiltrated the critical take. I found myself not trusting her pissed-off-ness, as you put it. Actually, some of her complaining about his prosody actually helped me understand it better. Deep personal dislike seems to be the back bone of Mlinko's position as a critic. Reminds me of the Tory attack ads. Hey, I'm the one who called him a "ghoul," & I meant it as a compliment. Is my favorite contemporary poet. Of course it's a compliment! A ha. I hate it too. 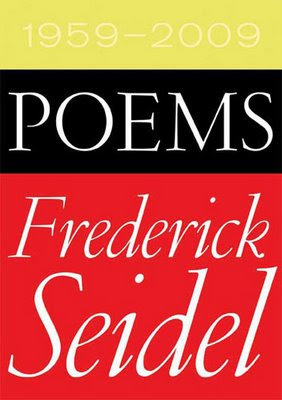 If you're interested, I have a review of the Seidel coming out in The London Review of Books—& even tho I'm one of the critics Ange takes on in her review, I have to say, I don't think "deep personal dislike" is a feature of her reviews in general at all. Her recent Moxley review is a real gem.